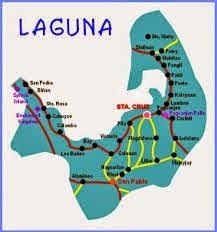 Laguna is one of the provinces of CALABARZON. Its capital is Sta. Cruz and this is where the famous Laguna de Bay is located. One thing that makes Laguna famous is that this is where the famous Jose Rizal was born. Aside from this, Laguna is also known for the Pagsanjan Falls which is a tourist attraction. Laguna is more than just a place to go for relaxation but it can also be a place where you can learn more about the latest in technology through the advanced University of the Philippines in Los Banos. There are so many festivals in this province such as the Sampaguita festival in San Pedro and a lot more. The source for the name Laguna is the Laguna de Bay. The fact is this body of water has something to do with the history of Laguna. This province was formerly called La Laguna and it was based on the bay. Captain Juan de Salcedo conquered the province that became part of Spain in 1571 and after that two Franciscan friars started the Christianization of the province. It took place seven years after the conquering of Salcedo of the province and its surrounding regions. Nowadays, Laguna is improving and increasing in terms of economy. Several factories were built by various companies in Laguna which is a sign of progress. In fact, this province is called as the Detroit of the Philippines because there are so many vehicles manufactured in this province. There are also power-generating plants in Laguna such as the Botocan Hydro-electric Plant, Caliraya Hydro-electric Plant, and Mak-Ban Hydro-electric Plant. It is also good to invest in education in Laguna because of so many colleges and universities to enroll such as the University of the Philippines in Los Banos, Polytechnic University of the Philippines, Laguna State Polytechnic University, De La Salle University, Pamantasan ng Cabuyao and many more. If we are going to look at Laguna, life is fast in here. You can find a job and reside in this place. You can also enjoy a vacation with your friends and family in the presence of beauty spots.